Time is soon coming in for those of you still running the older version of SagePay and should be running the SagePay 3.00 Upgrade now! We have had a number of new clients get in touch with regards to their current eCommerce platforms running on the older versions of the SagePay integration, and required an urgent update to the way their transactions are processed through their website. 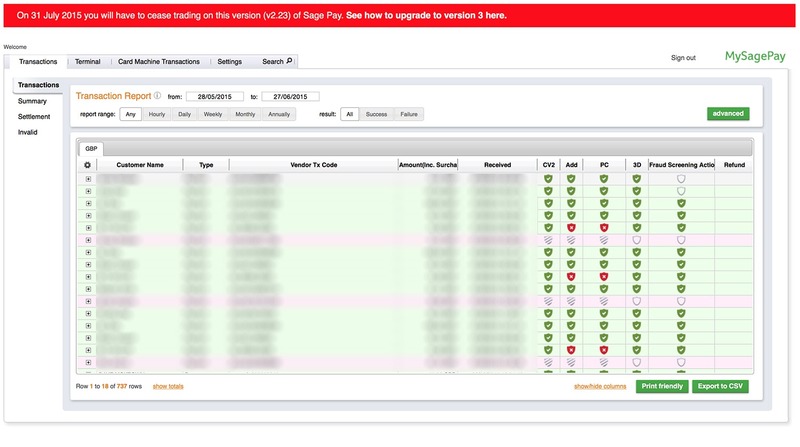 SagePay have given a deadline of the 31st July 2015 before they flip the switch on the older versions of their integration protocols for the new 3.00 version. This by no means is a hard upgrade, most elements are the same, unless of course you have a seriously outdated version of SagePay (2.20), in which case there is quite a bit more information that is required to be sent across to SagePay for transactions to still be processed after the 31st July. Some of our clients were a straight forward switch from 2.23, by just tweaking the version number in the specific SagePay class, others were a little trickier due to an old encryption method that is no longer supported by SagePay in their new 3.00 integration. If you are a web developer looking for information on the upgrade, SagePay have kindly provided extensive information on how to upgrade, but if you are looking for someone to upgrade your current website to the latest version, please get in touch with us, as we will be able to undertake this upgrade process for you. Please bare in mind that you have just a little over a month to perform this update, else you will no longer be able to process transactions via your website. So this is quite an urgent update and is required as soon as possible.